A slab of high-quality meat might be the archetypal barbecued dinner, but there’s plenty of room on the grill for other foods. Almost all vegetables (and many fruits) are delicious as grilled veggies and fruit, and they’re the perfect side dish – or even main course – for hot summer days. They’re also healthy and quick to prepare, leaving you with more time to enjoy the fruits of your labor with a lazy, midsummer meal. So whether you want to make some classic foil-packet potatoes or grill mango for a salad, fire up and get ready for a treat. Once reminiscent of comfort and home cooking, “meat and potatoes” now sounds boring, flavorless, and unhealthy. Yet potatoes need not be boring, especially when grilled, and the low-carb bandwagon misses the point that “it’s not that carbohydrates are fattening, rather that people eat too many of them,” according to Dr. Jean Harvey-Berino of the University of Vermont. Potatoes and other root vegetables can be prepared in a variety of delicious ways, and eaten in moderation they’re a good source of vitamins and minerals. Foil-packet potatoes are a classic for a reason, but sometimes changing up the ingredients can make them seem brand new. Try using other root vegetables like sweet potato, carrot, celeriac, or beets, or experiment with marinades and sauces. Celeriac in particular goes well with Asian-inspired flavorings like lime salt and peanut sauce, while beets can be served with their wilted greens. Because this style of grilled veggies and fruit is so easy, it’s simple to try out new ideas! 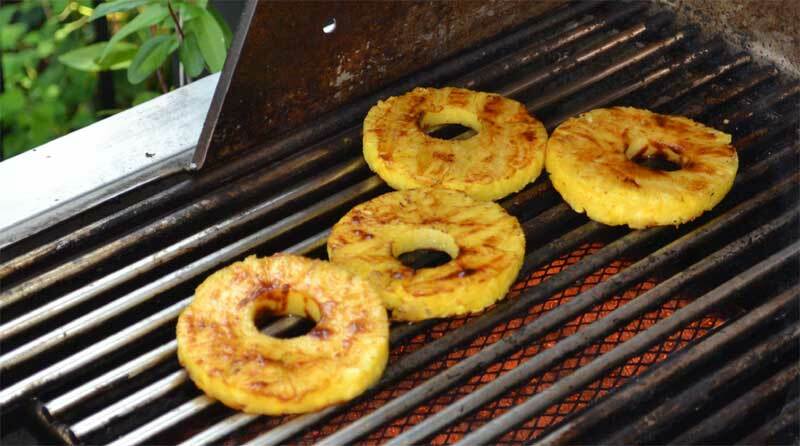 Root vegetables can also be cooked directly on the grill. This method can take a few more steps, depending on the vegetable, but it also gives the finished dish a fantastic flavor. Aside from carrots, most starches should be cut into half-an-inch thick slices (or equal-sized wedges) before grilling, and most benefit from a quick simmer so that they don’t end up perfectly grilled but undercooked. Coat your veggies in a thin layer of oil – some marinades also work well for this – and then get to grilling. Take them off the grill when they still have a slight bite to them, as they’ll keep cooking once they’re off the heat, then serve them as-is or as part of a grilled salad. It’s easy to eat your veggies when they’ve been grilled, giving them a delicious smoky flavor and a variety of textures in each bite. This isn’t about soggy, overcooked broccoli – these veggies can make for a real feast. By considering water content and structural integrity before grilling, it’s possible to make your least-favorite vegetables into your new favorite side dish. 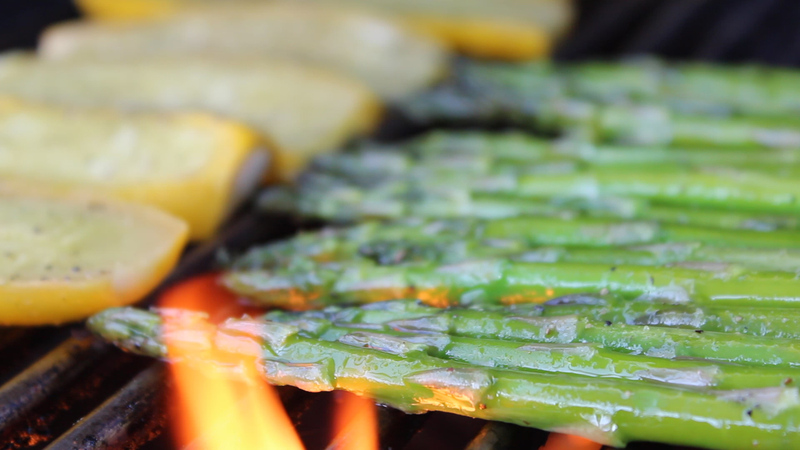 As a rule, the dryer and more compact a vegetable is, the easier it is to grill. Cauliflower, for example, is slightly easier to grill than broccoli, and grilled zucchini is delicious while grilled cucumber is a (quite literal) flop. However, very compact veggies take longer to cook completely, so either precook them before grilling or enjoy the crunch. (Half-done grilled vegetables are particularly delicious in summer salads with a light dressing.) Vegetables with high water content, like peppers, should be grilled for short lengths of time in order to keep them from collapsing or burning. Some vegetables can be grilled as-is, but most others do better when cut into chunks or florets. These should be large enough that they don’t fall between your grill’s slats; if smaller chunks are needed, use a kebab skewer or a grill pan to keep them safe. If you haven’t used a marinade for your veggies, dry them well and oil them lightly before grilling. Different vegetables cook at different speeds, but most should be done within five to ten minutes. Keep a close eye on them, and remember to turn them frequently so that they don’t scorch. Meat and fruit have been served together since before the dark ages, and there’s no sense in arguing with history on this count. The sugars and acids in fruit cut through the richness of meat, waking up your taste buds and allowing you to fully appreciate the range of flavors in a meal. Grilled fruit is also the perfect desert on a hot summer day: either serve as-is, toss in a warm fruit salad, eat with ice cream, or drizzle with white chocolate sauce. Most fruits can be grilled, but citruses and berries aside from strawberries are rarely worth the effort. When grilling fruit (aside from apples and pears, which can be cooked), the goal is simply to warm them while adding a subtle smoky flavor. To ensure this result, start with a clean grill and a low flame, as well as thick fruit slices which have been coated with a very thin layer of flavorless cooking oil. (Fruits can also be grilled as kebabs.) Err on the side of caution when deciding how long to grill them for, as fruit sugars burn easily and overcooked fruit can fall apart. Summer is a time of excess: lots of fun, lots of sunlight, and lots of beautiful fresh grilled veggies and fruit. By taking advantage of this harvest, you can grill a range of healthy, easy meals all summer long. If you’re a BBQ enthusiast you’ve probably used wood chips in the past to flavor the fish or meat on your BBQ grill and used marinades together with wood chips to produce many different and amazing tastes using fairly basic types of meat or fish. If you’ve done this you’ve probably developed a taste for BBQ smoked food so why not extend your BBQ smoking skills by buying a dedicated smoker grill to compliment your conventional BBQ grill? But although you might agree that you’ve got the space for an additional grill you may not be happy about the additional expense of buying it. (Maybe you’re already planning and budgeting to replace your current BBQ grill). But don’t worry. It’s possible to add a very inexpensive smoker grill to your garden cooking equipment without financial pain. The Brinkmann Gourmet Smoker Grill is currently available on sale on the web at a cost between $50 and $100 (depending on the model you choose). You might think that a grill at that sort of isn’t going to be very good. You couldn’t be more wrong. The Brinkmann Smoker Grill is not only widely considered to be good value for money (by lots of different Amazon customers), but it will also enable you to produce a wide variety of different barbecue smoke grills that will wow you with their authentic smokehouse flavor. In this article I’ll introduce you to the Brinkmann Gourmet Smoker and provide examples of how easy it is to use. At the end of my article I’ll also provide you with some tips on where to buy one at a good price. How Does a Smoker Work? The main idea behind a smoker grill is that the food is cooked by water (steam) and smoke not directly by heat from the charcoal (or gas burner). The fantastic flavor of the food produced on a smoker is obtained by using different types of wood chips or chunks mixed in with or replacing the charcoal. 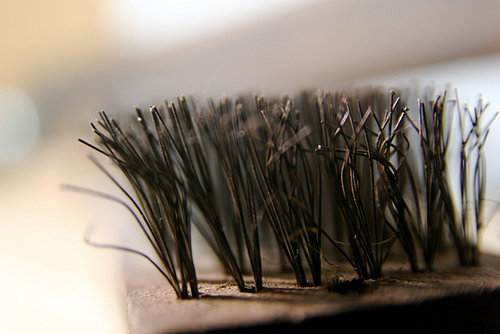 Because of how a smoker grill works cooking is carried out at a temperature around the boiling point of water (212 degrees F), which is a much lower temperature than on a conventional BBQ grill. This constant temperature makes cooking times fairly predictable, but it’s important to remember that on very hot or cold days the surrounding temperature of the air can lower or raise the cooking temperature of a smoker that’s out in the open. These variations in temperature need to be watched because they can have a significant effect on the cooking times. As I mentioned above, the Brinkman Gourmet Charcoal Smoker has a tremendous reputation. It’s made of stainless steel, but it’s quite small (17″x17″x35″) and lightweight (around 30 lb.). It, but it can cook up to 50 lb. of food on two cooking grills mounted one on the top of the other inside the main smoker box. The charcoal base pan can contain enough charcoal for 4 to 5 hours of cooking, but if more is needed it can be replenished through the side door of the smoker box. The smoker box sits directly on top of the charcoal pan. The water bowl is situated towards the bottom of this box and can contain enough water for 4 to 5 hours of cooking. The two grills are situated in the box above this bowl. The smoker box has a side door through which additional charcoal and water can be added during cooking, and two insulated handles so that it can be removed safely when hot. The lid has a temperature indicator and an insulated handle, but the lid shouldn’t normally be removed during cooking. Insert the bottom and top cooking grills into the smoker box stacked with the food you want to cook. Light the charcoal in the pan, and when it’s burning strongly (white ash over surface) fix the smoker box on top. During cooking keep the charcoal and water replenished until cooking is complete. You don’t need to keep a permanent eye on the smoker grill, just pop back to see it from time to time. – Pierce the meat with a fork in several places. Place it in the marinade in a suitable dish or a heavy-duty plastic bag. Refrigerate overnight. – Remove the meat from the marinade and place it on the smoker box cooking grid and pour the remaining marinade into the smoker box water bowl. For cooking use 5 lbs. of charcoal, 3 quarts hot water, 2 wood sticks (cherry, hickory etc.) and smoke for 2 and a half – 3 and a half hours. 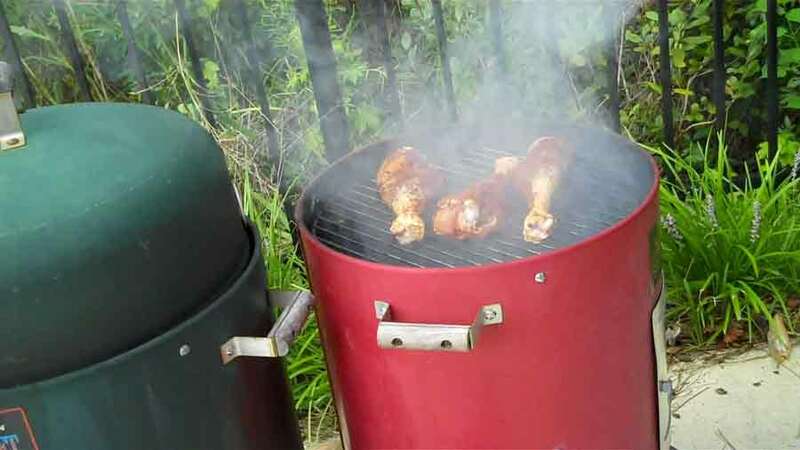 As you would expect, one important consequence of the lower cooking temperature on a smoker grill is that cooking can take a long time (frequently many hours, as in the recipe above), especially if you’re cooking large joints of meat. For this reason BBQ smoking requires more patience and advance planning than is necessary with a conventional family BBQ grill. If you’re contemplating buying a smoker grill like the Brinkmann Charcoal Smoker Grill, I recommend reading Amazon’s customer reviews. You’ll find that most customers were impressed with the quality of results they obtained using the Brinkman grill. It’s regarded as a good entry-level smoker that’s very easy to use, and it will make a great companion for your existing BBQ grill. So yes, if you’re a fan of BBQ smoking you should consider buying a smoker grill like the Brinkmann. Read a comprehensive review of the Brinkmann Gourmet Charcoal Smoker on our website at www.barbecues-for-sale.com. When you visit you’ll also find lots of other reviews of BBQ smokers and other BBQ grills and you can sign up for our FREE “Barbecue Secrets & Tips” emails. 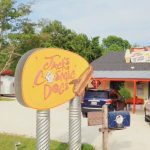 If you ever make a visit to Charleston (or are planning a drive between Myrtle Beach and Mount Pleasant) pull over on Hwy. 17 and try Carolina’s Best Hot Dog. 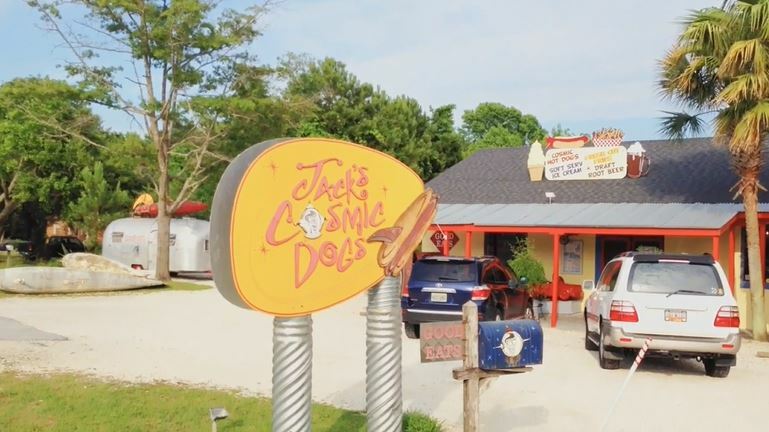 Jack’s Cosmic Dogs is a super fun retro hot dog joint that offers hot dog variations as funky as the great decor. Don’t let the giant missiles and gravel lot scare you. 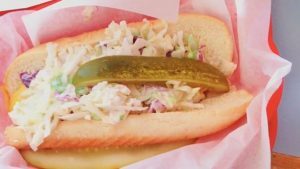 Jack’s Cosmic Dogs serves up fun and fast counter service hot dogs with super toppings like sweet potato mustard (their specialty) and blue cheese slaw. The sweet potato mustard is in such high demand they bottle it up and sell it right in the store. Hot Dog lovers can can you TOP THIS? Comment below and tell us where to find the best hot dog. No. This isn’t about pranking your pals and and shaking a beer to an overflow of foam and wasted brew. 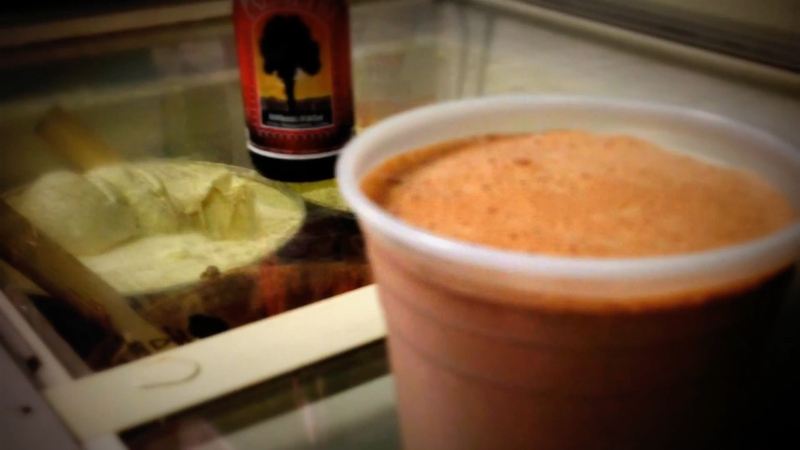 This is a quick how to on making a Beer Shake as in an Espresso Porter Beer Shake. 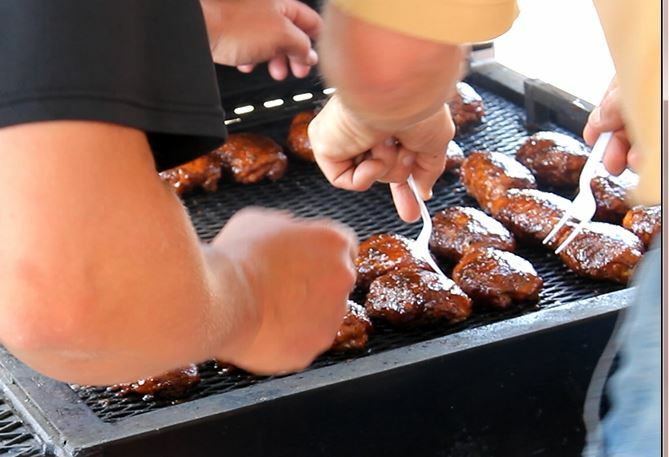 Our friends at Joe Riley Stadium in Charleston, South Carolina give us a walk through of the super easy recipe and technique. The home of the Charleston River Dogs is known for some fantastic grub and this this creative taste treat hits the mark during a 90 degree summer ball game. 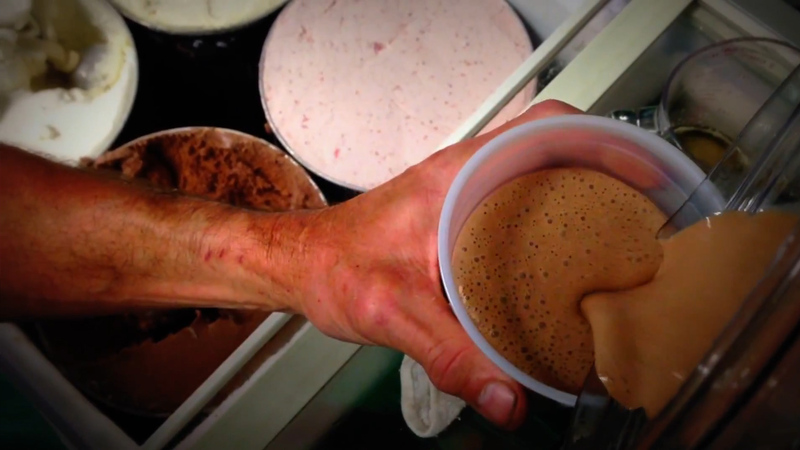 Combine cold ingredients in a blender and mix until thick and smooth. BarbecueTricks is a website and video series that investigates tips and tricks to help your outdoor cooking.